David McRae stands alongside his Pilatus PC6/C-H2 Turbo Porter. David McRae and his Pilatus PC6/C-H2 Turbo Porter. On October 28, 2016, about 1828 Alaska daylight time, a Fairchild Heli-Porter Pilatus PC-6, N5308F, was substantially damaged when it impacted mountainous terrain about 57 miles north-northeast of Port Alsworth, Alaska. The commercial pilot was fatally injured. The airplane was registered to Highland Air LLC and operated by the pilot under the provisions of Title 14 Code of Federal Regulations Part 91. Visual meteorological conditions prevailed at the departure and destination, with areas of reduced visibility and lower cloud ceilings along the route of flight. No flight plan was filed for the personal flight, which departed Lake Hood Seaplane Base (LHD), Anchorage, Alaska, at 1711, destined for a private airstrip near Port Alsworth, Alaska. According to a family member of the pilot, the purpose of the flight was to transport fuel from LHD to the family residence on Lake Clark, near Port Alsworth, which was an approximate 140 nm, 1.2-hour flight. The pilot had delivered a load of fuel the previous day and spent the night at the family residence. He flew back to Anchorage the morning of the accident and was expected to return to Port Alsworth about 1800. According to friends and family, the pilot was very familiar with the routes through the mountains to Lake Clark. 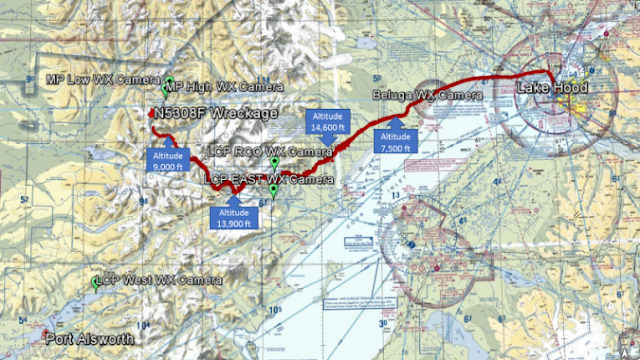 Typically, the pilot would fly through the Lake Clark Pass, unless the weather was low, in which case he would take the northern Merrill Pass route. Before departing on the accident flight, the pilot sent the family member a text message at 1623, which stated, "fueling now, will text." The family member noted that the wind generators at their home on Lake Clark were howling due to strong winds. She sent the pilot a video of the lake waves. She also sent a text message stating that there was no blue sky, but the mountain tops were visible and there was some sun showing in the direction of Port Alsworth. The pilot responded, "doesn't look too bad, 15-20 knots." Fuel receipts indicated that the pilot dispensed 98 gallons of Jet A-50 with Prist into the airplane's fuel tanks, and 213 gallons of Jet A-50 into the internal transport tank. At 1700, he texted, "going now." The family member responded, "no blue sky." According to a friend of the pilot who was working at LHD, he saw the airplane taxiing for departure about 1700. He stated that the weather had been great all day up until that time and that a flight he was scheduled to make had been put on hold due to deteriorating weather at his destination to the west. He sent the accident pilot a text message as the airplane taxied, asking where the pilot was going. They discussed whether the pilot had looked at Federal Aviation Administration (FAA) weather cameras, and the pilot indicated that he had not. During the flight, as the airplane passed Beluga Airport on the west side of Cook Inlet, the pilot sent a text message to the family member stating that "the pass is fuzzy." He also sent a text to his friend, "looks fuzzy" and "Guess I might have to slow down." The friend replied, "Ha. Turbine go high." The last message received from the pilot was, "On my way. Holes out west." Primary radar data obtained from the FAA Anchorage Air Route Traffic Control Center Terminal Radar Approach Control Facility showed the accident airplane departing LHD about 1711. The airplane flew westbound along the coastline and climbed to 5,600 ft mean sea level (msl). It remained about 5,600 ft for nearly 25 miles before descending to 4,600 ft, where it remained for about 8 miles before beginning a climb to 14,700 ft. The airplane made a series of "s" turns and began tracking west. About 1810, at 13,200 ft, the airplane turned to the northwest and began a descent. The track continued for about 25 miles, descending to the last recorded altitude of 7,600 ft about 1827 and about 2 miles southeast of the accident site. A search of archived FAA air traffic control records revealed no voice communications with the accident airplane during the accident flight. A radar study prepared by an NTSB senior air traffic investigator is available in the public docket. Flight track radar data and FAA Weather Cameras. According to the Alaska Rescue Coordination Center (AKRCC) records, a 406-MHz emergency locator beacon (ELT) signal was received about 1831 the evening of the accident. The AKRCC coordinated a search with Alaska Air National Guard and Civil Air Patrol (CAP) assets throughout the following 6 days. On October 30, the ELT's 406-MHz signal stopped transmitting. The mountainous terrain and poor visibility prevented access to the accident site until the morning of November 3, when a CAP airplane located the wreckage on the south side of a steep, snow-covered mountain about 6,500 ft msl. The pilot, age 55, held a commercial pilot certificate with ratings for airplane single-engine land, single-engine sea, and instrument airplane. He held a second-class FAA medical certificate issued on April 1, 2016, with a limitation that he must have available glasses for near vision. On the application for that medical certificate, the pilot reported 6,400 total hours of flight experience and 43 flight hours in the previous 6 months. No personal flight records were located for the pilot. The high-wing, conventional-gear, turbine-powered airplane was manufactured in 1975 by Fairchild Heli-Porter under the design authority of Pilatus Aircraft Limited of Stans, Switzerland. According to FAA airworthiness records, the airplane was equipped with a 575-shaft horsepower Garrett AiResearch TPE331-1-151K turbine engine under FAA supplemental type certificate (STC) SA5959NM. The propeller was a three-bladed Hartzell metal propeller. The airplane was equipped with an Artex ELT model ME406 and a radar altimeter. The airplane was also equipped with an internal 250-gallon fuel transport tank. There was no evidence that the airplane was equipped with supplemental oxygen. According to a friend of the pilot who was a mechanic, the airplane was in very good condition and he occasionally helped the pilot with maintenance. He stated that, a few weeks before the accident, he assisted the pilot with troubleshooting an electrical problem that was preventing the engine from starting. He repaired a terminal wire and the airplane was returned to service. According to the friend, the engine, airframe, and propeller logbooks were on the airplane at the time of the accident. The logbooks were not located. There was no record of the pilot receiving a weather briefing from an FAA Flight Service Station or from the Direct Users Access Terminal (DUAT) system. It could not be determined what, if any, sources of weather information the pilot may have accessed before the flight. The National Weather Service (NWS) Alaska Aviation Weather Unit's (AAWU) Alaska Surface Forecast Chart valid for 1600 on the day of the accident depicted an occluded frontal system with a cold front extending southwest of the accident site. A large area of expected light continuous rain was depicted along the frontal system. The chart also depicted an increasing pressure gradient with tight packing of the isobars over western and southwest Alaska. The accident site was depicted ahead of the expected precipitation area and was within an area of potential increasing southeasterly winds; however, no significant weather was depicted between Anchorage and Port Alsworth. The NWS AAWU Flying Weather Graphic Forecast charts issued for 1200 to 1800 and 1800 to 2400 showed VFR conditions for the planned and actual flight routes. The NWS AAWU icing and turbulence forecast charts indicated that the accident site was on the border between an area of predicted occasional to continuous moderate turbulence below 4,000 ft and isolated severe turbulence below 6,000 ft. The icing forecast chart for 1800 indicated that the accident site was under an area of forecast isolated moderate icing from 12,000 ft to FL200. The nearest weather observation for the intended destination that would have been available to the pilot before departure was Port Alsworth Airport (PALJ). The 1650 observation reported wind from 060° at 10 knots, visibility 30 miles, an overcast ceiling at 10,000 ft, temperature 10°C, and dew point temperature 4°C. The official weather observation nearest to the accident site was Sparrevohn Airport (PASV), about 60 nm west at an elevation of 1,565 ft. The 1755 automated observation reported wind from 140° at 20 knots gusting to 41 knots, visibility 10 miles, an overcast ceiling at 8,500 ft agl, temperature 9°C, dew point 1°C, altimeter 29.57 inches of mercury. A review of the MesoWest database from the University of Utah revealed remote automated weather system (RAWS) data from Stoney (STNA2), located about 13 miles west-southwest of the accident site at an elevation of 1,226 ft. The station reported a north wind at 6 knots with a peak gust of 17 knots, temperature 41°F with a temperature-dew point spread of 5°F and relative humidity 83%, suggesting a high probability of low clouds and restricted visibility. A review of archived FAA weather camera images at Lake Clark Pass East, Lake Clark Pass RCO, Merrill Pass Low and Merrill Pass High all indicated deteriorating weather starting about 1530 and visibilities of 1 mile or less in snow showers with mountain terrain obscured by 1600. The Lake Clark Pass West northeast view, which was closest to the planned destination, revealed that, at 1838, the clouds were above the highest terrain and visibility was unrestricted, which was corroborated by the family member's observations provided to the pilot. The FAA weather camera website states that the camera weather images are supplementary products and may only be used to improve situational awareness. The closest upper air sounding was from the NWS Anchorage (PANC) Forecast Office, about 105 miles east of the accident site. A review of the 1600 sounding indicated a high potential for moderate rime-type icing conditions at 9,330 ft within the shallow layer of broken altostratus type clouds. The air sounding wind profile indicated that, at the accident airplane's cruising altitudes between 9,500 ft and 10,500 ft, the wind was from 210° at 20 knots, with a temperature of -10°C. At 14,500 ft, the highest altitude the airplane operated at during the flight, the wind was from 235° at 23 knots with a temperature of -11°C. The primary freezing level aloft was about 4,880 ft.
Archived satellite data was obtained and processed for 1800 and 1830 over the accident area. Infrared image for 1830 depicted the accident site under multiple layers of clouds with temperatures corresponding to cloud tops near 30,000 ft or high, cirrostratus-type clouds. The closest Weather Surveillance Radar-1988, Doppler (WSR-88D) was NWS Anchorage/Kenai (PAHG), located 65 miles east of the accident site showed echoes consistent with snow showers. The radar product's depiction of the large area of echoes and the satellite imagery confirm that a layer of altostratus to nimbostratus-type clouds were over the route and over the accident site during the period, with likely snow showers, associated with lower ceilings and visibilities over the route of flight. The United States Naval Observatory website lists the following astronomical data for October 28, 2016: sunset 1807, end of civil twilight 1853, moonset 1807. A weather study is available in the public docket. The remote accident site was located in steep, mountainous, snow-covered terrain within the Neacola mountains of the Alaska Range, with a peak of about 8,336 ft in the near vicinity. The wreckage was located about 6 miles south of Merrill Pass west and 14 miles northeast of Lake Telaquana within the Lake Clark National Park and Preserve. The airplane initially came to rest on the south side of an east-west ridge of a mountain bowl. When the rescue crew arrived, the airplane was mostly covered by 3 ft of snow and was in a slightly nose down, level attitude oriented on an easterly heading across the mountain face at an elevation of about 6,500 ft. A review of photographs provided by AKRCC revealed that the forward fuselage and cockpit had been torn away and partially separated from the aft section forward of the wing roots. The forward fuselage and engine were displaced aft and to the right and displayed significant crush damage. The right wing was missing, and the left wing was partially attached and displaced downward. The empennage was intact, and the rudder was fractured about 3 ft from the top. Jet A fuel was present on recovered clothing and manuals. A Garmin GPSMAP 396 and a personal electronic device were recovered by the rescue and recovery crew. The airplane was not recovered due to the hazardous terrain and snow conditions that prevailed throughout the following year. On July 8, 2017, a National Park Service airplane overflew and photographed the wreckage, which had slid down the mountain about 100 ft during the summer snow melt. Photographic evidence revealed that the left and right wings were separated from the fuselage near the wing roots and remained about 100 ft above the fuselage section. The left and right main landing wheels were present in shallow snow below the wings. All primary airplane components were present. To date, the airplane has not been recovered nor examined. The Garmin GPSMAP 396 was examined and downloaded at the NTSB Vehicle Recorder Laboratory. The flash memory chip contained files that revealed power cycles and flights for a period ending October 24, 2016. No data was recovered for the accident flight. The portable electronic device was passcode-protected and data was not recovered. The Neacola Mountains are a rugged mountain range running north to south between south central Alaska and south interior Alaska. The highest peak in the range is about 11,413 ft msl. There are two primary passes between the east and west sides of the range. The Lake Clark Pass runs a course of about 220° and terminates at Lake Clark and Port Alsworth at the southwest end. Merrill Pass is about 32 miles north of the Lake Clark Pass and consists of higher terrain and narrow canyons. Flying into predicted or actual icing conditions is not approved. Federal Aviation Regulation 91.211 states that supplemental oxygen is required by flight crew operating at cabin pressure altitudes above 12,500 ft up to and including 14,000 ft for more than 30 minutes. Supplemental oxygen is always required by crewmembers operating above 14,000 ft pressure altitude. The accident airplane was unpressurized. The radar data indicated that the airplane was operating above 12,500 ft for 31 minutes and above 14,000 ft for about 14 minutes. Hypoxia is a state of oxygen deficiency in the body that can occur at high altitudes as a result of the decreased pressure in the atmosphere. According to FAA Advisory Circular (AC) 61-107B, the portions of the brain governing judgment and cognitive skills are the first to show degraded function when the body enters a hypoxic state. Other signs and symptoms include rapid breathing, poor coordination, visual impairment, fatigue, nausea, headache, dizziness, and a feeling of euphoria. The AC stated that, while significant effects of hypoxia usually do not occur in a healthy pilot at altitudes below 12,000 ft, there is no definitive altitude at which the effects of hypoxia begin or end. The FAA recommends that supplemental oxygen should be used on any unpressurized flight at or above 10,000 ft in the day or 5,000 ft at night. The onset of hypoxia is insidious, and it can be difficult for pilots to recognize the symptoms and take corrective action before becoming impaired. If hypoxia is suspected, pilots should don oxygen masks immediately and descend to an altitude below 10,000 ft.
On October 28, 2016, about 1828 Alaska daylight time, a turbine-powered tailwheel-equipped Fairchild Pilatus Porter PC-6, N5308F, sustained substantial damage after impacting mountainous terrain about 57 miles north-northeast of Port Alsworth, Alaska, in the Neacola Mountains of Lake Clark National Park and Preserve. The airplane was being operated as a visual flight rules (VFR) cross-country personal flight under the provisions of Title 14 Code of Federal Regulations (CFR) Part 91. The commercial rated pilot, the sole occupant, sustained fatal injuries. Visual meteorological conditions prevailed at the departure and destination, with areas of reduced visibility and lower cloud ceilings along the route of flight. No flight plan had been filed. The flight departed Lake Hood Seaplane Base, Anchorage, Alaska, at 1711, destined for a private airstrip near Port Alsworth. During a phone conversation with the National Transportation Safety Board (NTSB) investigator-in-charge (IIC) on October 31, a family member said that the purpose of the flight was a fuel delivery to a family homestead near Lake Clark, just as the pilot had done the previous day. 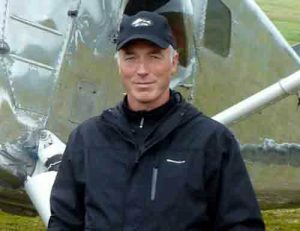 According to friends and family, the pilot was very familiar with the routes through the mountains to Lake Clark, and he had the airplane outfitted with an internal 250-gallon fuel tank. Typically, the pilot would fly through the Lake Clark Pass unless the weather was low, in which case he would take the northern Merrill Pass route. According to a family member in Port Alsworth, the pilot requested the weather conditions at Lake Clark prior to departure, which were reported as windy with a high overcast cloud layer and "no blue sky". 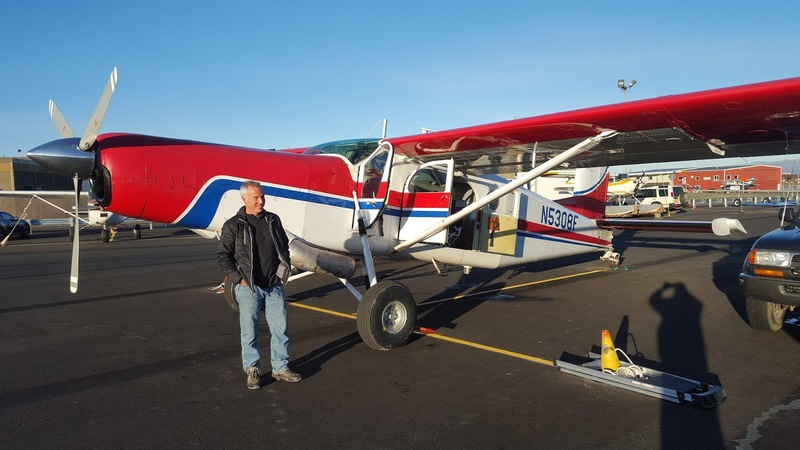 A preliminary review of Federal Aviation Administration (FAA) radar data revealed that after departure the airplane turned west after reaching the northwest side of Cook Inlet and prior to reaching the Lake Clark Pass entry. According to a text message provided by a friend of the pilot, the pilot communicated that the pass "looks fuzzy" and "on my way, holes out west" while flying en route prior to crossing the mountains. The airplane then climbed up to an altitude of about 14,600 feet on the east side of the mountains, and descended westward down to 7,700 feet near the accident site. The last radar return at 1827 indicates a ground speed of 119 knots, a rate of descent of about 833 feet per minute and a heading of about 340 degrees. The airplane was outfitted with an Artex Emergency Locator Transmitter model ME406, which is designed to transmit an encoded 406 megahertz (MHz) signal for 24 hours to overhead Cospas-Sarsat satellites every 50 seconds, and a continuous swept Very High Frequency (VHF) homing signal on 121.5 MHz for 50 hours. According to Air Force Rescue Coordination Center (RCC), an Emergency Locator Transmitter (ELT) signal was received about 1831 with partial position information from an ELT that was registered to N5308F. A more accurate position was obtained by the RCC about 1922. About 2252, the RCC coordinated a search of the area by helicopter; however, low visibility and darkness prevented search area access. The FAA issued an alert notice at 2253. The RCC coordinated daily search flights with an HH-60 helicopter and HC-130 airplane from October 29 through November 3. The 406 MHz signal stopped transmitting late on October 30. Low ceilings and visibility prevented a search of the immediate ELT area for 5 days. On November 4, the Civil Air Patrol joined the search due to a forecast for improved weather. The ELT 121.5 MHz VHF signal was still transmitting a continuous signal and was used by the search crews to locate the wreckage on the morning of November 4. The pilot's remains were recovered from the scene by RCC rescue personnel. The remote accident site consists of steep, mountainous, snow-covered terrain oriented north and south within the Alaska Range with a peak of about 8,336 feet in the near vicinity. The wreckage is located about 6 miles south of Merrill Pass west and 14 miles northeast of Lake Telaquana within the Lake Clark National Park and Preserve. The airplane wreckage is located about 6,500 feet on the south side of a ridge line, heading north. Search crews reported substantial damage to the forward portion of the fuselage and nose. At 1755, an aviation routine weather report (METAR) from Sparrevohn LRRS Airport (the closest weather reporting facility) reported, in part: wind 140 degrees at 20 knots, gusts to 41 knots; visibility 10 statute miles; sky condition, overcast at 8,500 feet; temperature 48 degrees F, dew point 34 degrees F; altimeter 29.57 inHg. The Federal Aviation Administration (FAA) Aviation Weather Camera images on October 28 from Lake Clark Pass East show weather diminishing at about 1547 ADT to below 1 statue mile, and images from Merrill Pass High and Low Weather Cameras indicating diminishing visibility at 1624 to at or below 1 statute mile visibility in snow with mountains obscured. Official sunset for October 28, 2016, was 1815 with civil twilight ending at 1901 ADT. A detailed wreckage and engine examination is pending. The airplane was equipped with a Aireasearch Garrett Honeywell TPE 331 turbine engine. A Garmin 496 GPS was recovered from the scene and sent to the NTSB Vehicle Recorder Laboratory in Washington, D.C., for download. Alaskan bush pilots are a different breed. I was offered a job flying PA-32s from Skagway,Ak, which is a tourist area in the state that features plane rides for cruise ship excursion customers. My wife kicked and screamed, and our female band singer started crying after I told them of the offer, so I wound up staying put. What I did learn about that environment is that you have to fly very well, and take big chances with weather and terrain. It's a frontier that demands the utmost piloting ability to negotiate. Crying women with microphones is no foundation for flight safety. Moistened lead singers are ambiguous at best, subject to vast and varied interpretations. I generally find that you can’t go wrong if you follow the band’s bass player.